Wake Up Call ran from 26th – 30th March at Redbrook Exhibition Space & Studios. 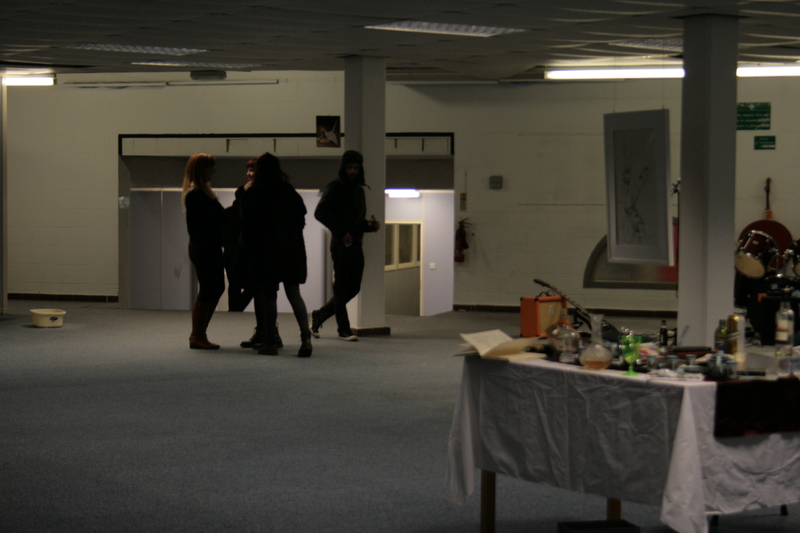 Conceived by Northern Young Artists, it was the first exhibition of the year at their permanent space. The bold theme and concept of the exhibition was that of artists exhibiting unfinished and experimental works. Artists were given the rare opportunity to submit works that could be unreconciled either aesthetically or conceptually to provoke genuinely constructive dialogue between artists and viewers. Exhibiting artists were Julie Newton, Charlotte Owen, Corinne White, Ash Barrow, Scott D’Arcy, Katarzyna Jablonska and Fiona Halliday. 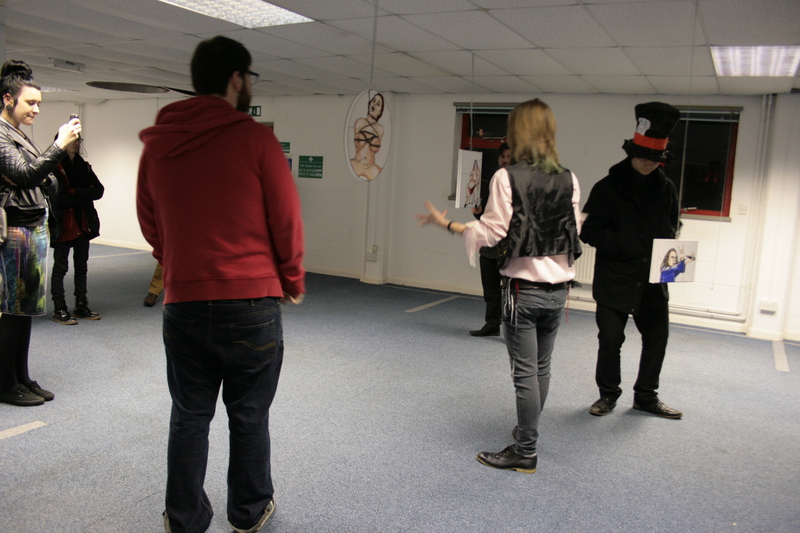 Work on show was of various media, sculpture, installation, paintings, drawings and performance. 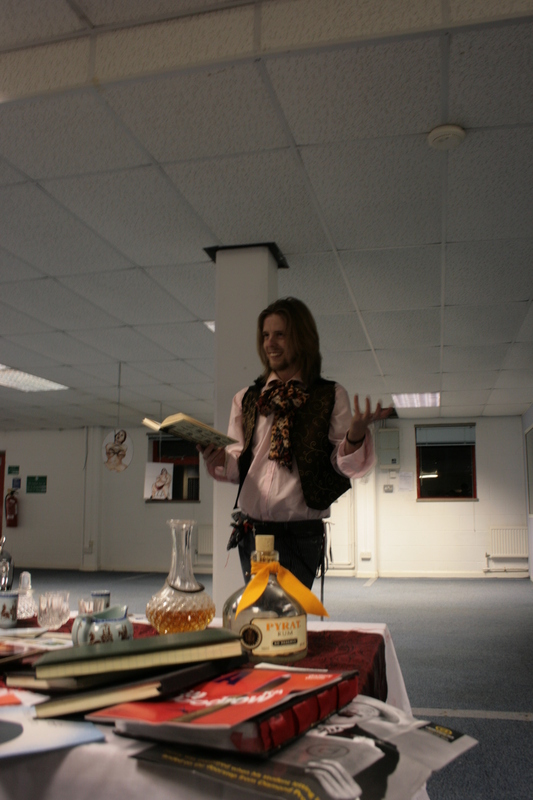 The launch event revolved around Scott D’Arcy’s Mad Hatter Art Lectures in which he began the evening informally engaging visitors around his table and guiding them through paraphrased and appropriated parts of famed and infamous lectures on art, he then led his captivated audience around most of the exhibits drawing honest and interesting reactions and thoughts out of the audience and reflecting upon the work himself. This, among other things, broke down barriers between the artists, curators and visitors and prompted and even prompted a spontaneous spoken word performance between hausPlant and an unknown visitor. Ash Barrow is a painter and figurative artist who often uses explicitly sexual imagery, it’s a subject which is important to her work but is not often able to be exhibited in public, Wake Up Call gave Ash the opportunity to experiment with presenting such works. In her installation The Peep Show, explicit works were set back to back with paintings of a less provocative nature. These were then suspended from the ceiling in a cluster, because of this way of hanging the paintings rotated, thus giving the viewer a choice of which to look at, whilst simultaneously the explicit imagery became unavoidable. Ash also exhibited a trailer for her upcoming film The Experiments inspired by The Russian Sleep Experiments story, but seeking to transpose such ideals into 21st century pressures of conformity and slavery to capitalism. The exhibition space itself presents a curatorial challenge, being large in square feet but somewhat low in usable wall space. In each exhibition so far, NYA have been creative, and playful with how to exhibit works, this time opting to hang works from the ceiling, which lent itself to particular works, particularly Katarzyna Jablonska’s submitted drawing entitled Dance. Katarzyna is a Manchester based artist whose work seeks to draw on her personal view of portraying beauty through the human figure in passion and dance. Dance is an ephemeral drawing of the human figure in the midst of a dance; light fluid pencil marks follow a mesh of limbs and hands composed carefully on white paper, set in a white frame and in Wake Up Call hung from the ceiling which drew attention to this understated piece. A different approach was brought to the playing field by MA student Corinne White, who chose to place her large scale frames on a purpose built structure which sat in the furthest corner of the space, alongside a workbench and books. This snapshot into a world of working drew the viewer in, with its large scale, and provocative text. Corinne’s paintings and installations explore many things, are consistently emotive and honest, creating a distinct feeling that simultaneously disturbs and refreshes. The idea of a structure was taken further by Redbrook studio-holder Charlotte Owen, who created pretty much an entire room, the walls and ceiling of which were built with her plaster works; stretched hessian with plaster applied in bold gestural, textural ways. This amounted to a very dark space in which visitors to the exhibition were unsure and tentative whether or not they were ‘allowed’ to enter, perhaps allaying to a strength of darkness. 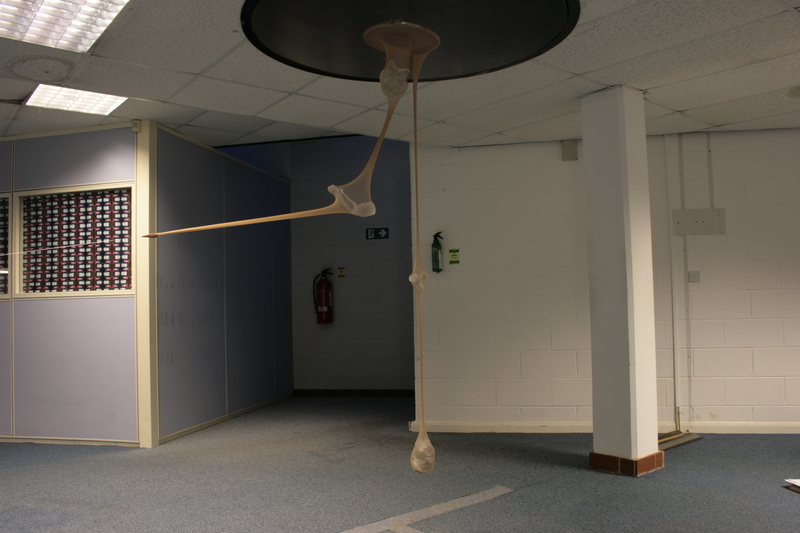 An installation/sculpture by Barnsley artist Julie Newton. 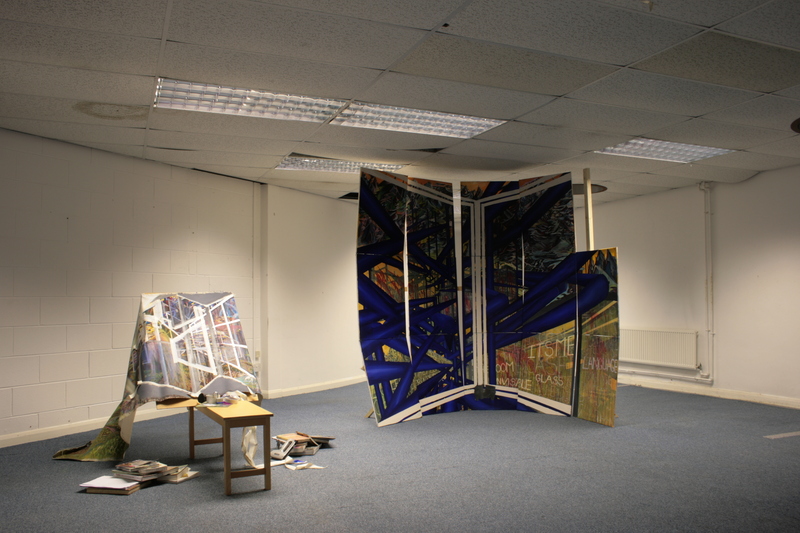 Barnsley-based artist Julie Newton installed her piece Irrecusably Intertwined…’ underneath the skylights of the gallery. A combination of tights and resin casts of dolls’ limbs, the concoction hung hauntingly and menacingly over the heads of visitors, ghostly limbs stretching and caught in the ceiling, suspended and solid in the strange light and effect created by the skylight spaces. Julie’s work often seeks to evoke the uncanny through de-familiarisation of everyday objects; this piece is definitely testament to this. Fiona Halliday’s painting hangs in the background, behind exhibition visitors. Fiona Halliday exhibited a small painting, submitted both as unfinished in both a practical and a conceptual sense. Fiona creates still life paintings, as well as exploring formal aspects of painting such as light and composition, her paintings are increasingly exploring narrative and symbolism. As her practice moves forward she finds herself pondering, among other things, the importance of naturalism, when materialism and objects themselves is not the subject. The 30cm square oil on linen painting, depicting origami cranes and other ephemera, was hung high, just above eye level. Wake Up Call was an interesting experiment on several levels and succeeded in breaking down barriers for some exhibiting artists in allowing honest, thoughtful and useful conversations to flow between all involved. It will be interesting to see where these artists go from here.